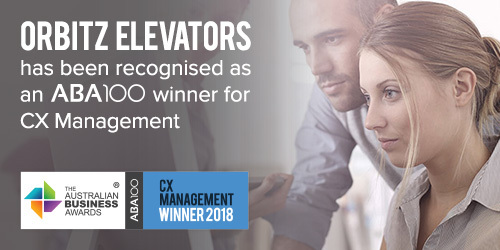 Orbitz Elevators has been recognised as an ABA100 Winner for CX Management in The Australian Business Awards 2018. The Australian Business Award for CX Management recognises organisations that have achieved outstanding results through initiatives that demonstrate excellence in customer experience management. Orbitz Elevators entered the Australian and offshore market with personalised services and focus on developing long lasting clientele relationships. Orbitz Elevators continues to rapidly grow within the industry and embrace any opportunities presented to its continually growing portfolio. Its key personnel including senior management and team members have over 500 years collective experience in the elevator industry throughout the world. Its reputation continues to strengthen within the market and we are becoming a recognised force for exceeding customer expectations. At Orbitz Elevators, the business philosophy is delivering high quality services to its customers with integrity and professionalism. Through strategic recruitment, training and development programs, they have established a business with a powerful team culture all sharing the same vision, values and goals of the organisation. Every employee at Orbitz Elevators thoroughly understands the critical importance of delivering professionalism to its clients and how it can differentiate the business within the industry. The state of the art elevator products offer superb performance, reliability, as well as aesthetics and sophistication. They have a large range of specialised elevators to choose from, including elevators designed for hospitals, nursing homes, shopping centres, public buildings, high rise buildings, residential houses as well as vehicle elevators. The business invests in high quality products and can modify products and designs to meet our clients’ needs and specifications from a wide range of products and stylish interiors. All elevators are compliant and supported with Australian Design Registration Certificates. Beyond fully installing their products, Orbitz is very passionate about maintaining and extending the lifecycle of its customers’ valuable assets. Whether its Maintenance, Modernisation or Repair, their aim is to maximise value, convenience, customer satisfaction and equipment lifecycles. Their high-quality service and customer centric business model has driven tremendous growth across Australia and overseas, and their products and services are now being distributed in major cities such as the Gold Coast, Brisbane, Sydney, Melbourne, Perth & Sunshine Coast.